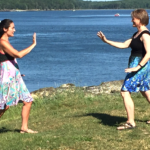 Nina Zeldin, a certified Tai Chi instructor and staff member at Healthy Acadia, thought Tai Chi was a perfect fit for Tidal Falls Preserve, Frenchman Bay Conservancy’s flagship preserve. Frenchman Bay Conservancy “works to protect ecosystems, lands and water for the benefit of all, and Tai Chi for Health works to protect our bodies and minds . . .